Stamp 1: Superb! Probably CTO with a neat, central KIEV 3 12 18 cancel and the back of the stamp perfectly clean. Probably washed off a philatelic cover or sheet of paper. The date is a bit late for this Trident which was one of the first to appear and the 7 ruble value was used non-philatelically on Money Transfers so could not easily be obtained genuinely used. BUT main drawback: no one has ever signed this stamp. Maybe it was signed on paper which has been removed from the back but that’s no help. And who will sign it now? 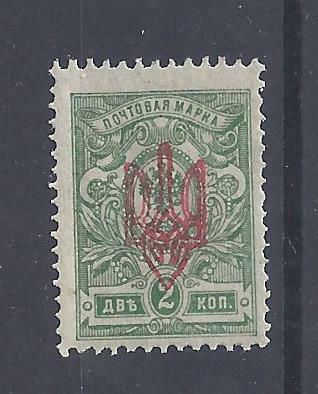 Stamp 3: Oh, a variety INVERTED OVERPRINT not listed by Bulat. Most probably CTO since there is gum on the back. Rather messy trident. On the back a big handstamp AUFDRUCK FALSCH. Oh dear …. However, look more closely and you will see that FALSCH has been crossed through in pencil and beside it there are the initials of Dr S in what I believe to be the handwriting of Dr Seichter and bottom right is his handstamp Dr Seichter in violet. It looks like Seichter made a mistake which he corrected. The overprint is not a forgery – I don’t think it is. But who wants a stamp with a great big AUFDRUCK FALSCH? 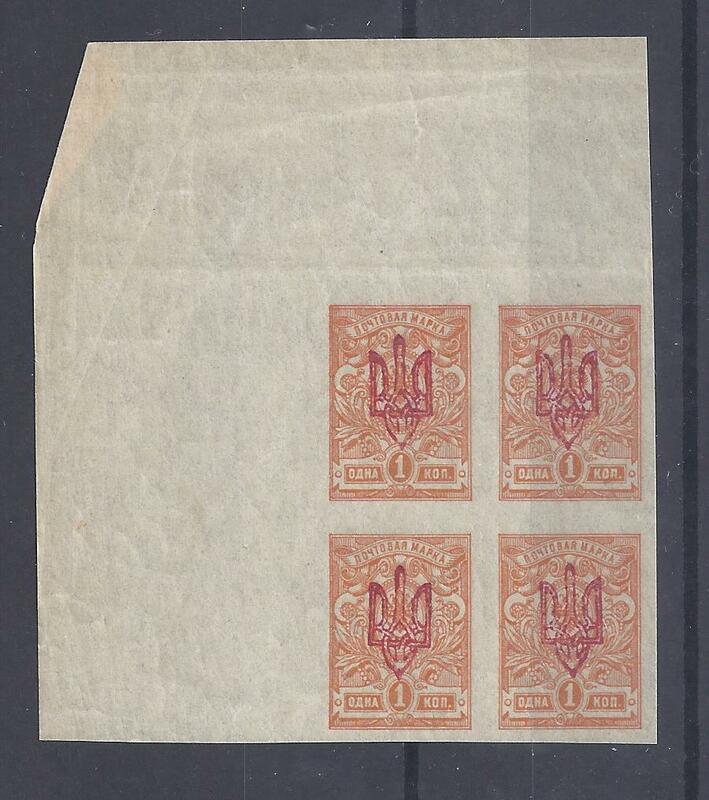 Stamp 4: Oh …Oh… Kyiv 1 Trident and underneath Kyiv 2 (I’m going to propose sub-type 2a) in similar or identical inks. Unreadable cancel. Clean back, no gum, tiny pencil annotation.. Signed UPV! I think it’s genuine though unlisted and, of course, philatelic. Still, if you like rarities this is one you are not going to see again next week …. Your task: Suppose you had to price these. Which would you ask most for? 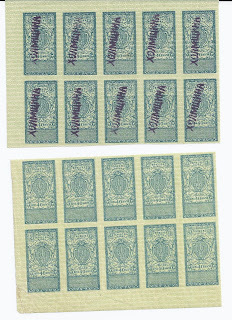 Formulars were also used for internal post office transactions and these are less often seen, perhaps because they were unfranked. In case of a temporary shortage of regular formulars, official business formulars were sometimes used with some handstamp or manuscript modification to indicate the different use. This is the case with the two items below which both use Official Business money transfer forms for ordinary over the counter transfers. The first one was used in January 1919 at ULADOVKA in Podolia to send 283 rubels to Vinnitsa where it arrived and was signed for. The correct 3 rubel franking was all on the front with the right edge officially clipped (to prevent re-use of the stamps) before being sent to the archives. From there it found its way into the Vyrovyj collection and was sold as a single lot (Lot 303) in the 1986 Schaetzle sale of that collection. 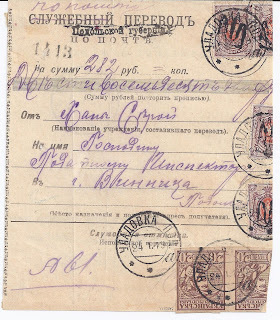 The formular is on thin paper and looks like a cheap post-1917 reprint and it is modified at the top left in manuscript to indicate its use for an ordinary post office counter transaction. 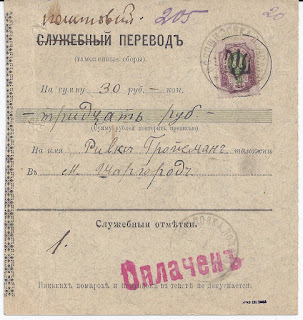 The second card was used at VOROSHILOVKA in Podolia to send 30 rubels to Shargorod where a receiver mark was applied though a note suggests that the money was not collected. This card has been expertised bottom right by UPNS ZELONKA. Both formulars are rarely seen. On 4 June 2015 I blogged a long piece about Kherson Trident overprints. I am now preparing my whole stock of about 200 stamps for auction sale and looking through them, I can add a few additional points. I found I had only one expertised copy of a Kherson Trident, the stamp below which is signed Dr Seichter and which could be used for reference. But the one kopeck block above also provides essential information. 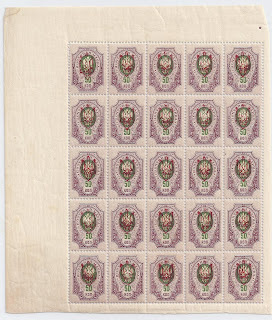 Stamp dealers and stamp speculators often end up with unsaleable stock. Maybe they just bought too big a quantity. What can you do with it? Well, you can try to pass the parcel or you can wait for better times or you can try to add some fresh touch to what you have. 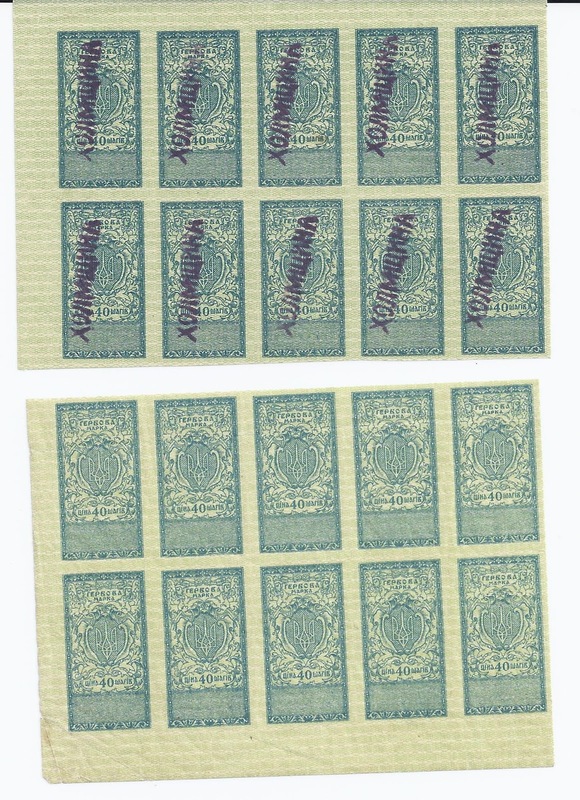 There were large remainder stocks of the Ukraine National Republic fiscal stamps of 1919, especially the two low values of 40 and 50 Shahiv, which were probably bought very cheap in the 1920s and 1930s by a few hopeful dealers. I have many copies in fresh MNH ** condition. I also have many copies of the fantasy overprints added to these stamps in an attempt to make them saleable. For example, the overprints for KHOLM shown below are usually attributed to a tireless fabricator of fantasies, Captain Schramschenko, and are really only of interest if you are making a collection of Capatain Schramschenko fantasies (I’m not). Another story. 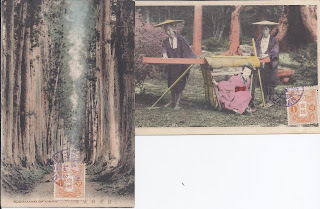 At one time it was popular to collect picture postcards with a stamp stuck on the picture side and cancelled. 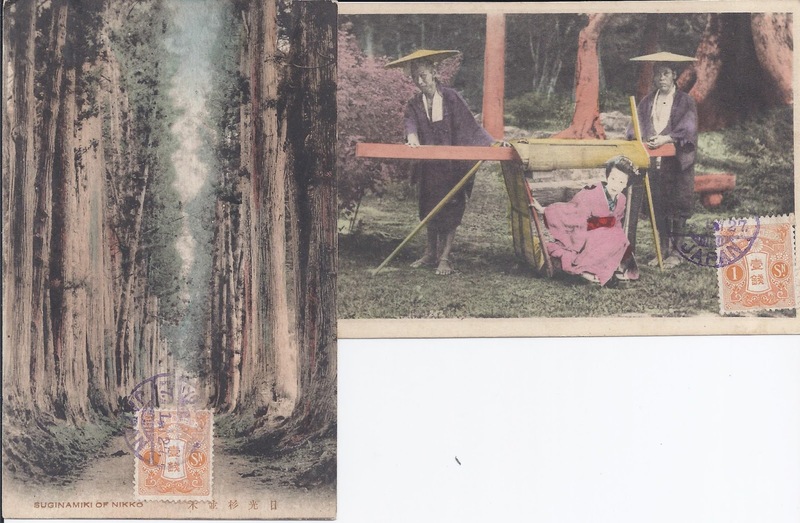 The stamps and YOKOHAMA cancels on the front of the two cards below are genuine. What about the backs? I think it’s possible that the Soviet Philatelic Assocaiton imported these cards, but if they did so, the cards would have arrived in one parcel of 100 or 1000 not individually. 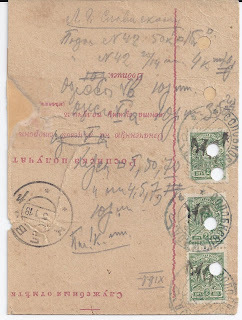 It’s also possible that the Soviet PA typed its address onto the back of each card, individually – note that in line 4, there is a full stop after per. on one card but not on the other. The SPA did have a Roman alphabet typewriter and the typists did play around with spacing, as someone has done in S O V I E T.
But clearly these Japanese cards were not that popular. Some enhancement was required and someone (and possibly the SPA but it does seem rather crude) thought of Postage Due. We have one genuine Postage Due stamp on the cards and four different cancels / cachets, all looking as if they have never been used before.. I think they are all fake. This is perhaps only interesting because it helps me understand a much more significant item in my possession. Below is a genuine cover sent in August 1924 from Ekaterinburg to Moscow, using a system which allowed a letter to be sent unfranked with Postage Due to be paid at the other end. 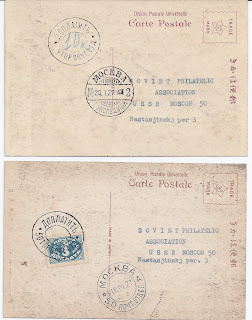 Already in Ekaterinburg a Postage Due cachet has been applied and I think it genuine. I think it also possible that the three stamps belong to the cover but that they were not cancelled at the time, which sometimes happens to Postage Due stamps. This defect has been made good using a forged MOCKBA 19 cancel dated 28 8 24. If the cancels were genuine, then this would have been a very valuable cover since the first Postage Due stamps are extremely rare used. There are stamp issues today where 99% of all use is philatelic. Think of issues for Antarctica, any country, any period. In these cases, the 1% of mail which is not philatelic is all the more interesting because it is what confirms the stamp issue as a genuine stamp issue, available to frank mail. 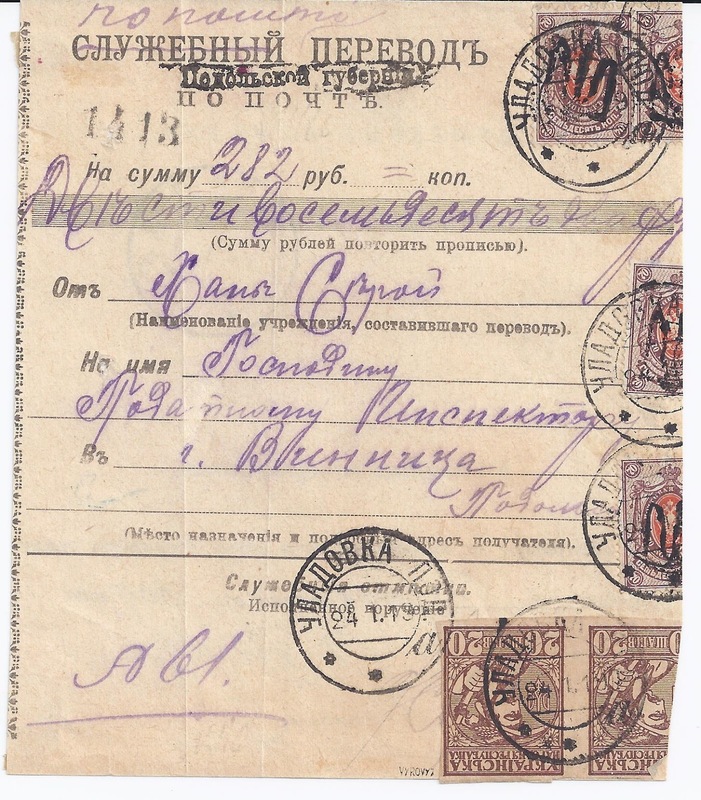 In the Russian Civil War, there were plenty of stamp issues. Some were completely bogus, some were in common use, and some had just 1% genuine use. This is true of the issues of the North West Army which in 1919 briefly controlled several post offices on Russian territory and was organised enough to pass mail backwards (westwards) into independent Estonia. Have a look at the two covers above. I don’t think either is philatelic. The top one was registered in manuscript from Gdov on 2 10 19. We know that Gdov had lost its own canceller and was using the canceller of POLNA in what had been St Petersburg guberniya. The cover is addressed bi-lingually and has a TALLINN EESTI receiver dated 5 10 19. 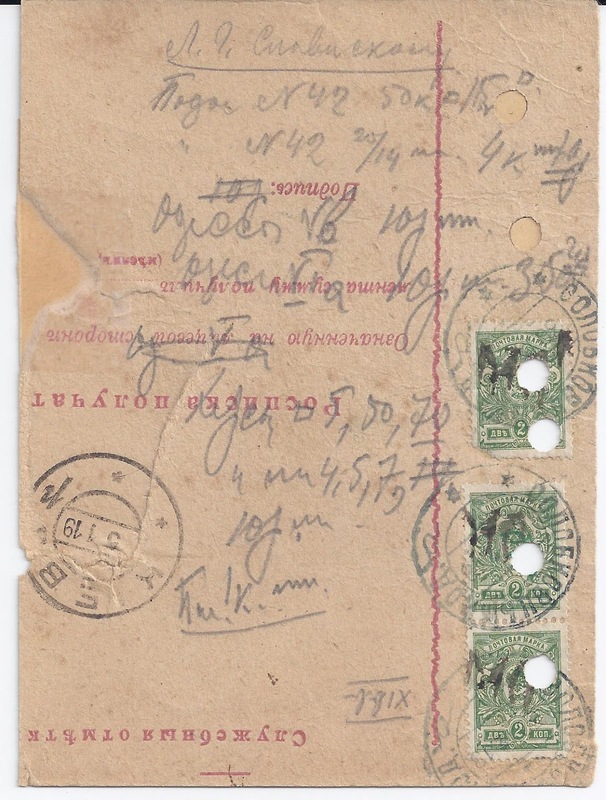 On the back the sender gives his street address in Gdov, Petrograd guberniya and there is also a one line note at the bottom which I would like someone to translate for me. Pis'ma tol'ko zakaznym prisylat'! - Send only registered letters! The cover is franked at 1 rubel, so one might guess at 50 kop postage + 50 kop Registration. The second cover is very interesting. Again it is registered. This time there is a standard rubber cachet but not much ink on the pad. In indelible pencil someone has written “19” as the registry number but in ordinary pencil underneath someone has identified the post office. 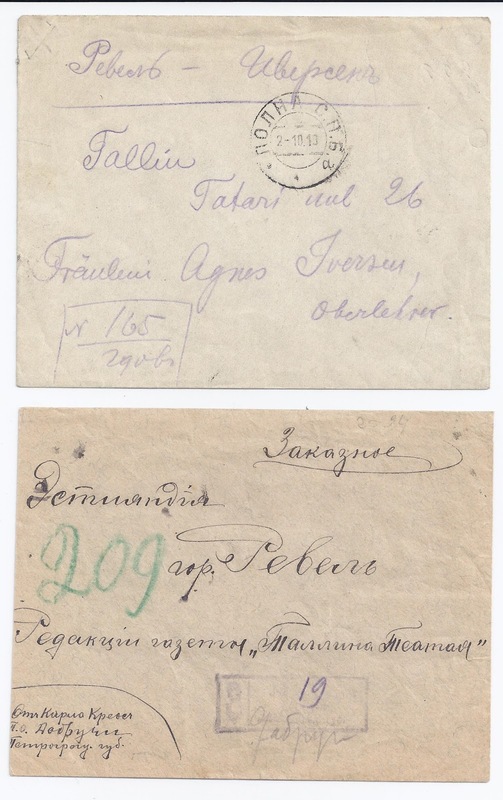 This is not so easy to read until you look to the left and see that the sender gives an address in Dobruchin, Petrograd guberniya. 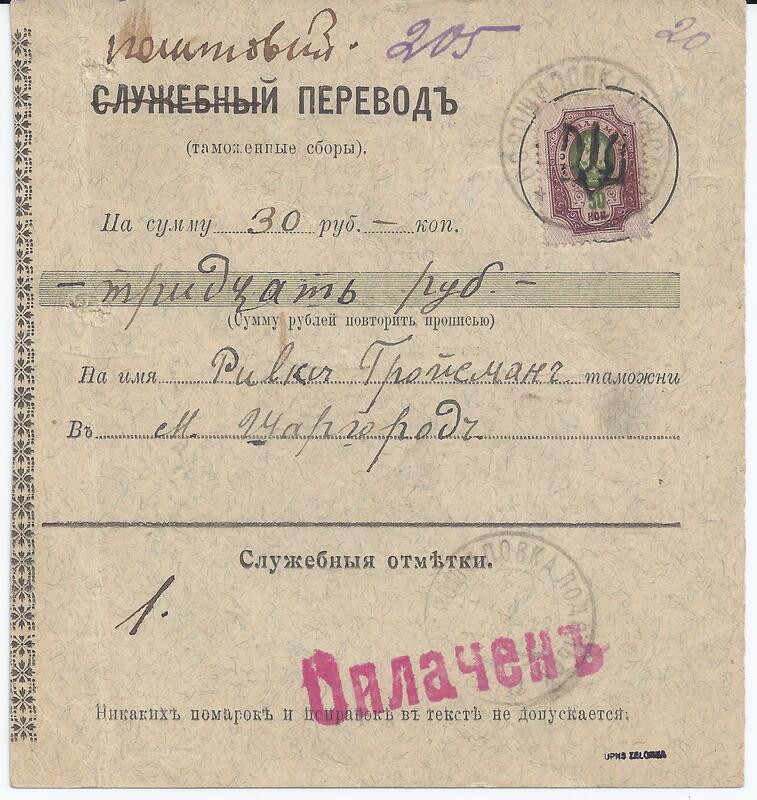 [Igor Ryss translates the name of the sender as Carlo Kreos] The full name of Dobruchin is in fact DOBRUCHINSKOE and it was in Petrograd guberniya. It just about Googles ( 5 results) and is now in Pskov oblast, and so in 1919 North West Army territory. Igor Ryss tells me that I can get more results using the spelling DOBRUCHI and this also yields a map which shows the location of Dobruchi in relation to Gdov and Pskov. 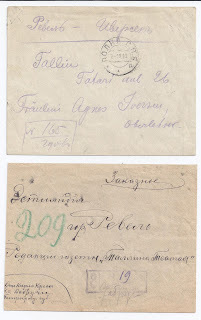 The cover is addressed to a Tallinn gazette called Tallinn Theatre and there is a receiver cancel of 21 9 19 which touches the top right stamp. Now look at the franking. 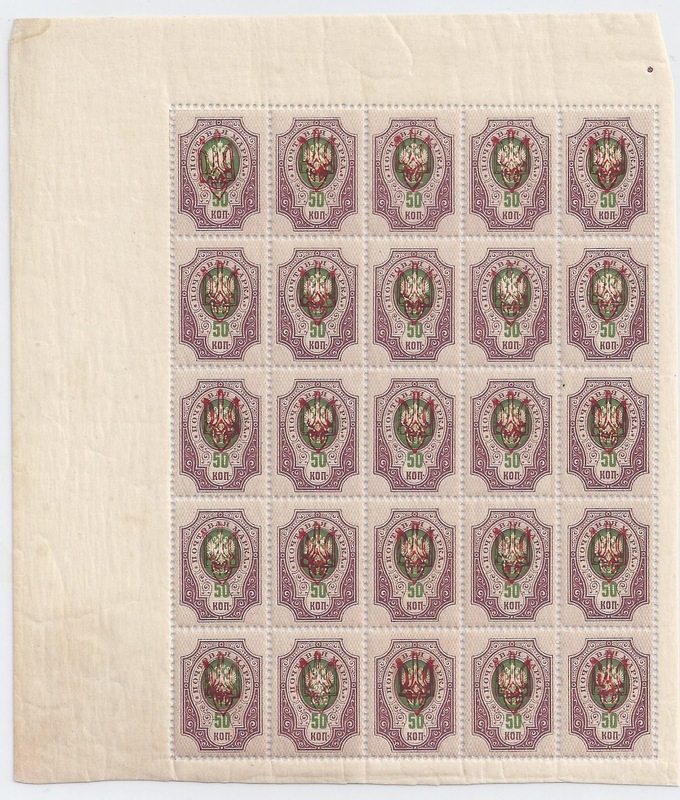 It’s one rubel made up of 25 kop in North West Army stamps and 75 kop in unoverprinted stamps, all used as a seal. The stamps are cancelled in pen and it is readable DOBRUCHIN… PETROGRADSK…GUBERNI.. 17 – 9 – 19 (The clerk seems to have tailed off at the end of each word so I have put dots). 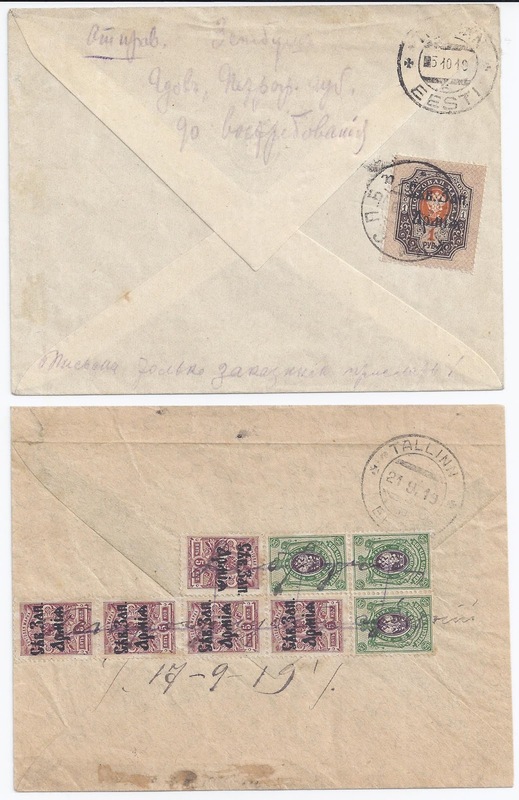 Two covers are better than one and it looks like here we have a one rubel registered letter rate used to send non-philatelic letters. 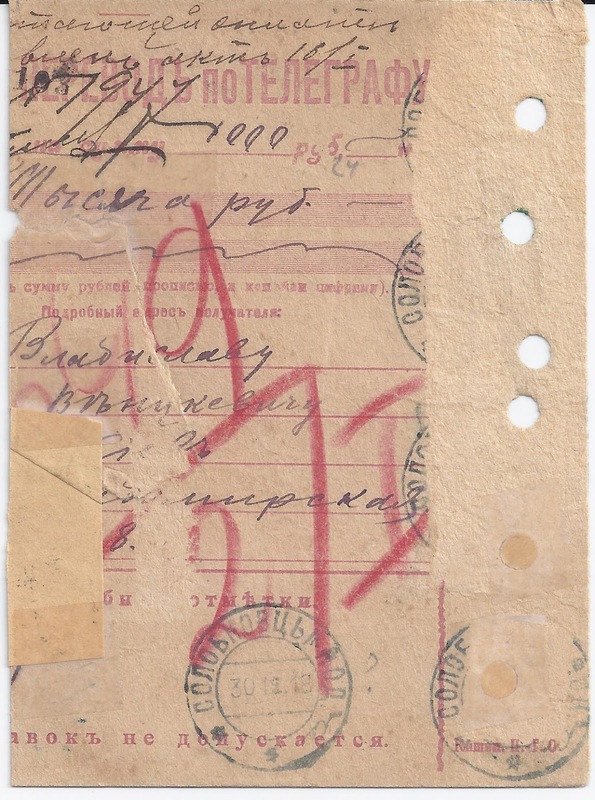 This is the tariff that K.Freyman gives in an article in the British Journal of Russian Philately for 1951, cited by Dr Ceresa in his handbook on the N W Army issues; he also claims 10 kop for Printed matter and 50 kop for ordinary letters). 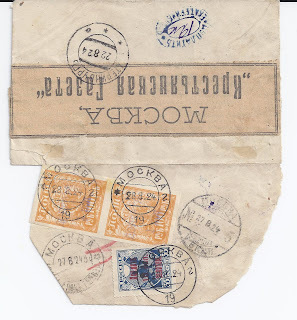 We also seem able to add Dobruchinskoe to the list of post offices under North Western Army control, not only because of use of the stamps but because of the backward journey to Tallinn which would not have been possible if this was an item of RSFSR mail.